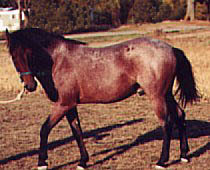 Taos SMR 2222 is a bay roan Cerbat stallion. The rare Mustangs of the Cerbat Mountain area of northwestern Arizona are some of the purest descendants of Spanish horses in the United States. Blood testing shows that they carry genetic markers typical of Spanish horses. They are also laterally gaited, with a gait similar to the Paso breeds, but not with such extreme action. Cerbat horses are mostly bay and chestnut but at least 50% are also roans, with the dun dilution also occurring. Cerbats are unusual in that roan foals are born roan, whereas in many other breeds roaning occurs only after the foal coat has been shed. Thankyou to Marye Ann Thompson of Apache Trail Ranch, Willcox, Arizona for sharing this lovely photo with us. The Grullo roan on this page is also a Cerbat stallion.